A sweet, fruity, warm recipe that's great for either breakfast or dessert...if you can get over the eggy custardy flavor and texture. (For that reason, I think this dish is better served cold than warm.) Sliced pears and fresh (or frozen, I used fresh) raspberries are baked in a lemony pancake-like batter, then sliced into wedges, sprinkled with a little powdered sugar, and served warm. 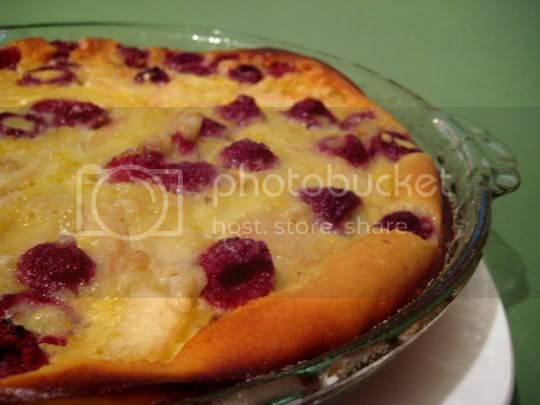 The dish was surprisingly easy and quick to make (I don't know, something about the word "clafouti" sounds complicated), with probably the pear slicing taking the longest time. I baked the clafouti (which is supposed to be a sort of crepe, pancake, custard thing) for the suggested 40-50 minutes: the edges were browned, but the middle was still a little jiggly. I didn't want to burn the edges, so I took it out and assumed it would firm up while cooling. It did, sort of, but the slice I ate was still very wet. That being said, my favorite part of this was the crust!